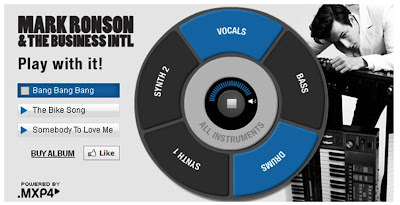 Different elements of the Mark Ronson tracks can be turned on and off, whilst links within the banner push to iTunes to 'Buy' or Facebook to Like. This is a nice way of turning an Paid Media execution into a piece of Owned Media and Spotify Premium users are rewarded by being able to hear a 5 track preview of the new Mark Ronson album in advance of the September 27th general release. NB I have deliberately included an image here rather than the full interactive version of the Mark Ronson ad. If you want to play, then the Spotify blog has the full execution embedded here.